Old? Old! You said it! Jeez r u stupid ? The new and improved Aquacopter? yes..people did die in this. "Two crew members were killed and two others were missing Thursday after a US Navy helicopter crashed in the Gulf of Mexico. Two others were recovering from injuries. The survivors, found floating with inflatable life jackets, were rescued more than 30 minutes after the helicopter went down. They were in stable condition at a hospital in Corpus Christi, said a lieutenant with Naval Air Station Corpus Christi. Several Coast Guard and Navy craft were searching for the missing crew members Thursday afternoon. The crew was aboard an MH-53E helicopter, also known as a Sea Dragon, that was practicing minesweeping when it crashed about 11 a.m. about 17 miles offshore. Crew members reported mechanical problems and the helicopter was attempting to return to shore when it crashed, said a commander at the naval air station. " 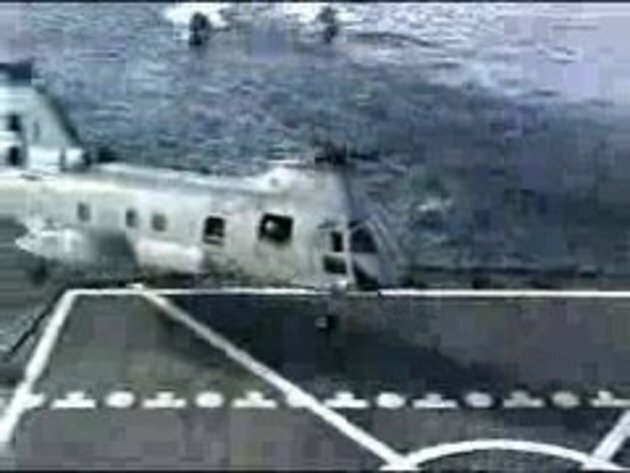 by the way #8 its not a 53 .. its a ch 46 sea knight..
and i almost became a statistic just like this.. in the same kind of helo.. landing out at sea.. on a LST. the year was 1985 off the aulstralia coast.. its not cool. Totally fake! I can see the wires! It's a tiny helicoptr! "Crew members reported mechanical problems and the helicopter was attempting to return to shore when it crashed, said a commander at the naval air station." Wires!? What wires? ...or do I need something to get me hallucina... eeeehh? Nevermind! #10...can pilots of helicopters eject or would they not get chopped up like crisps? sometimes, some of you peeps don't get it when other peeps are being sarcastic!! Hmmm, we have video proof of the copter trying to land on a ship and yet the commander is saying that it was returing to shore? Which is it? There's a big difference between "the middle of the Gulf of Mexico" and "shore"!! #23 - Well, i guess so, but they keep playing 911 over and over and over again, and allot more people died then so how about they never play footage of that ever again either..?? Hey guys actually its not mechanical problem.. watch closely at the helicopter rear tire, when landing.. it accidentally hooked to the safety fence of the ship..so the heli try to accelerate and end up turn over.. I hope you'll agree, we don't need the idiotic comments though? The news article referred and linked to by most_uniQue in #8 and #16 has no connection to the video shown. The MH-53E Sea Dragon is a single rotor Sikorsky build helicopter (COD players out there might now its bigger brother the MH-53M Pave Low - almost same design but different loadout). The one you see landing, or rather not, however is a tandem rotor CH-46 Sea Knight build by Boeing Vertol. Hope that helps clearing up that middle of the Mexican Golf and shore confusion and why, despite smaller fleet ships following the vessel, the helicopter crew wasn't picked up for another 30 minutes.